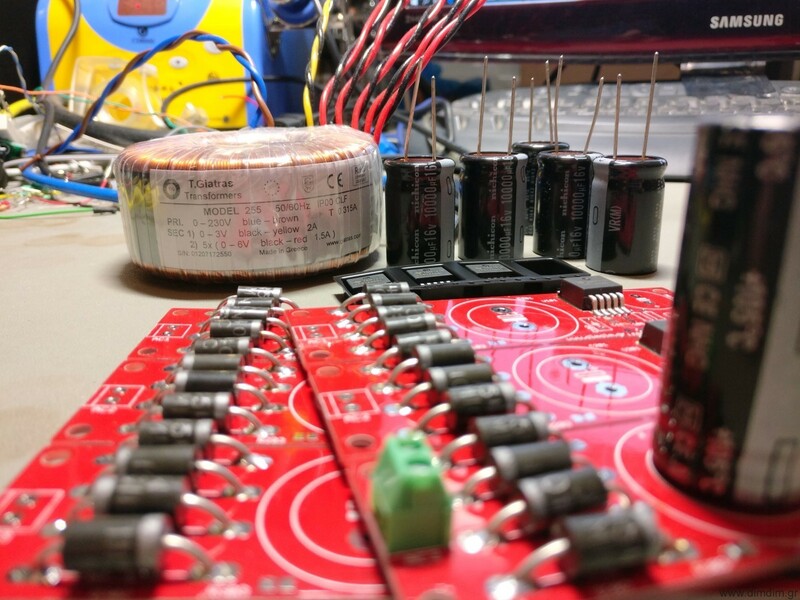 Linear power supply for the Raspberry Pi: is it worth it? Pretty much everyone agrees on this one, still, it took me a while to get on the bandwagon. Probably because I am not using an RPi as my main transport.. In order to test this I needed a proper linear power supply, capable of outputting at least one “real” amp at 5V. It would also have to be as low noise as possible. After some searching I ended up picking the TPS7A4501 for the job. Since its output voltage is adjustable, it would also come in handy for various projects. 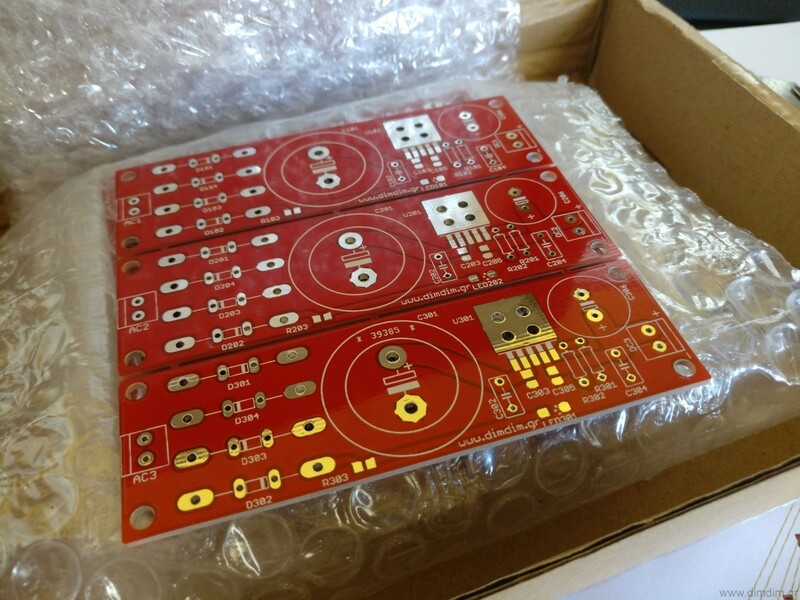 So I designed a PCB that would do a proper job of “hosting” the regulators along with the necessary rectification and filtering stages and had a bunch of them made. I also ordered a proper custom-made toroidal transformer, one that would have 5 secondary windings, each of them outputting 6VAC at 1.5A and one sixth winding outputting 3V at 2A. The end game would be to replace all of the RPi’s on-board switching regulators with linear ones. But for starters I’d just power the RPi with 5V via its USB port. Here are a couple of RPi 3s being powered by my linear supplies. This setup would be used to compare the Allo.com original Boss with its new “v1.2” version. More on that in another post. Power draw on the linear power supply was measured to be at about 500mA @ 5V. 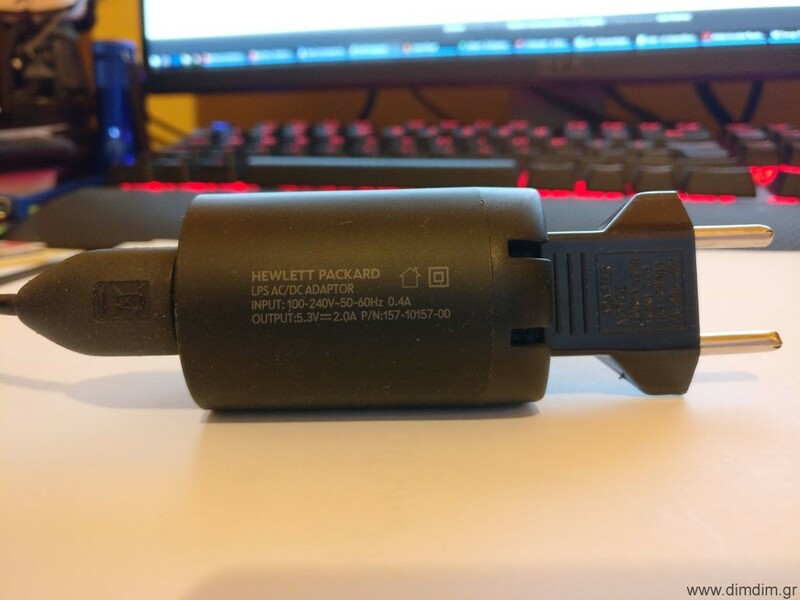 It’s an old but beefy switching mode power supply from an old HP tablet. It’s specc’ed at 5.3V @ 2A. In order to be as impartial as possible, I took the setup to a friend’s house and had him and a couple of other friends audition the RPi powered either from the SMPS or by my linear power supply. In both cases, the RPi was running Archphile and was connected to my upgraded-with-ES9028Pro-and-Mercury-Buffalo III DAC via USB. The difference between the two power supplies was immediately obvious. It was like with the SMPS we had an at-best mediocre source – DAC combination, while with the linear power supply the setup became “proper”, it sounded “in-place” among my friend’s high performing system. The sound stage became better defined, the detail level went up, overall the presentation was more realistic. In other words, it was like the jitter of the system went down, but perhaps the noise levels in the system also decreased. In other words, IMHO no serious audiophile should be powering his RPi by a run-of-the-mill 5V SMPS, even if he is using it as “just a USB transport”. This entry was posted in DIY Audio, RPi and tagged Linear, Power Supply, RPi by Dimdim. Bookmark the permalink. is the DAC/Buffalo powered via the USB? there’s a massive thread on computeraudiophile on the effectiveness of ‘special’ USB cables and after reading that it was clear that anything about the USB comms that makes the receiver circuitry work harder, such as error detection/resend, thereby causes fluctuations in power draw and hence _noise_ transmitted through to later stages. In this case the DAC was using a USB powered Amanero, so it was being fed noise from the RPi which naturally trickled down to the dac. But I’ve heard differences between USB cables on dacs with powered USB receivers and galvanic isolation. Pretty much everything matters.. it’s very frustrating. I have plans to upgrade my Buffalo with an XMOS-based USB receiver of my own design, followed by Ian’s reclocker. That should take care of most possible issues. But even then, I expect the USB cables and power supplies to make some difference, albeit much smaller. so your going into xmos programming now! I’m doing so now after the frustration of trying to hook up to a D8 amp via i2s and realising it needs i2c prepping after all. and multi amps need simultaneous volume control too…. would you consider making an extra board for me if you go ahead? and indeed the power supply of this article?! at 3v perhaps I’ll be able to power the DIYINHK board too (3.3v ideally). as for the xmos board, if it can happen let me know please! yes, the Xc language/libraries are disconcertingly convenient. I think I may try to bypass re-working the xmos i2s/usb reference code and do my own as, apparently, their code is old and certainly looks to be using under-the-hood programming quirks that are probably covered by the Xc extensions. Wow, this look really nice indeed, would love to make it for my rpi3 and piano 2.1. I’m a DIY wannabe but If understood right the Vout it’s regulated by the R2 and R1, what are the diodes and capacitors in front used for? and the two SMD capacitors? Thank you for your interesting blogs! I am very curious about your comparing the two Boss versions. I own HW rev. 1.2, but the new version is named also “1.2” (hw rev 1.4? with the new usb socket). You won’t prove anything with this project – Especially trying to come to a general conclusion about “linear” vs. “SMPS” simply won’t work. You conclusion just refers to your old beefy mediocre PC wallwart vs. your custom-made linear supply. If you’d put as much brain into an SMPS build the result might look different. Been there done it! It’s true that my conclusion does apply to my specific wallwart (and presumably other wallwarts of similar quality, a.k.a. “run of the mill” wallwarts). But my point was that power does matter, and should be looked into. My linear supply may be custom, but it is neither exotic or expensive or difficult to design and build. The same could not be said for an SMPS with similar performance. I for one would not even think about designing such a thing. 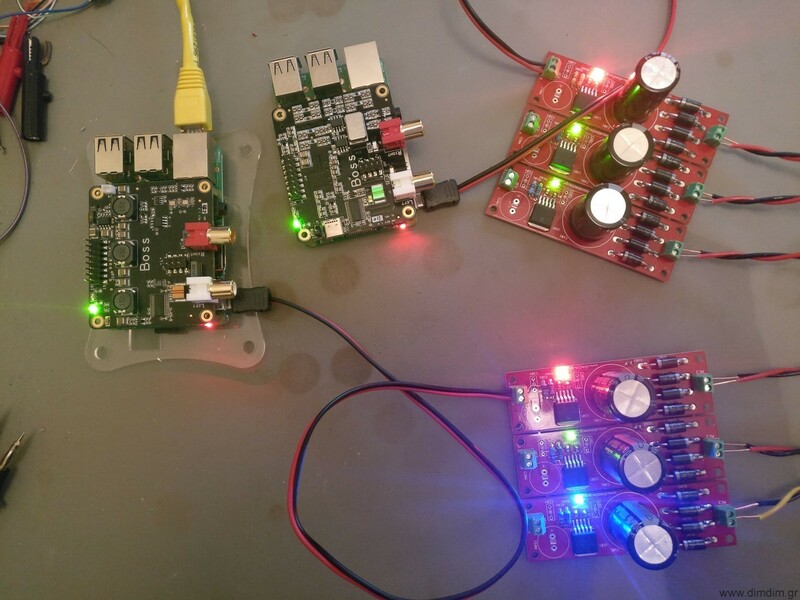 did you try to omit the Raspberry DC/DC converter and feed the Pi with separate supllies for 5V/3,3V/1,8V? Good questione, but imho it’s not simple. For example, the RPI 3b has an power ic RT8088AWSC “2.7MHz 3A Step-Down Converter with I2c Interface” for 5Vcore e 5Vdd core and a PAM2306AYPKE “1.5MHz DUAL HIGH-EFFICIENCY PWM STEP-DOWN DC-DC CONVERTER” for 3.3V and 1.8V”. The switching frequencies are far from audio band. Do you have a pcb to sell or can you share the gerber’s file? Would you mind sharing your pcb design files?